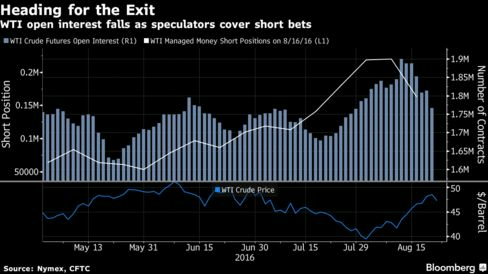 Oil’s $9 rally from below $40 a barrel on Aug. 2 through the last week was fueled by a flood of investors exiting bets that prices had further to tumble. Commodity Futures Trading Commission data show that money managers reduced their short position by 56,907 contracts in the week ended Aug. 16, the most ever. Overall open interest, or the number of futures contracts outstanding on the New York Mercantile Exchange, tumbled from 1.9 million Aug. 11 to 1.787 million as of Friday, further sign of traders leaving the market.